It’s been a madhouse in the THIH household over the past few days. Talking with clients, meals plans, catching up on article writing, going to an awesome EIDA meeting – it’s all been happening. At once. I look forward to a little relaxation (and answering customer questions!) at Strawberry Fields this weekend. The idea to highlight my most influential cookbooks came about one evening as I noticed the same cookbooks sitting in my “peruse” pile once again. Thanks to Peter, we own somewhere around seventy-five cookbooks. With an abundance of culinary direction, you would think I vary my cookbook choices. But, no. Instead, I find myself reaching for the same books over and over again. Some books I choose because of versatility, others because of a childhood connection or something specific they’ve taught me. So here, I give you my five most influential cookbooks. They may not be my favorites (although they usually are) or even best sellers, but they have shaped the cook I am today. 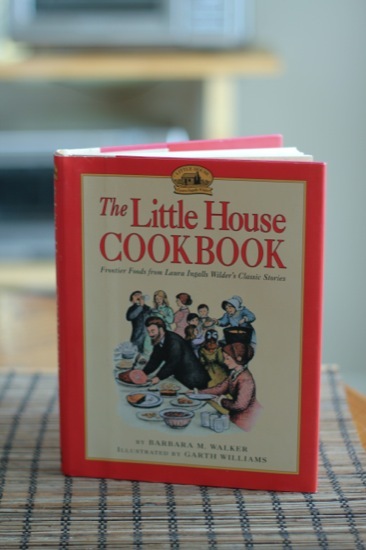 The very first real recipe I ever cooked was from The Little House Cookbook. Up until the age of nine or ten, the most “cooking” I had ever done was to layer roast beef and cheese in a dish, sprinkle it with salt, and microwave it (no, I’m NOT kidding). Then one day, I laid my eager little hands on this cookbook and took a leap forward in culinary prowess in the form of Almanzo’s apple turnovers, made from scratch. Sure, apple juice ran everywhere and the crust was thicker than a hand-knit sweater, but those turnovers were MINE. Over the years, I’ve made around 2/3 of the recipes in this book, including deep-fried vanity cakes (which taste as good as they sound) and hardtack (ditto). This cookbook is also the only one I’ve ever read though completely. When I was a wee lass, I used to sit on our old striped couch and devour it like a novel. The original paperback is in Colorado with my dad. When Peter bought me a hardcover copy a few years ago, I immediately read the whole book through again. It’s that good. I don’t have a picture of this cookbook because I don’t own a copy (!) In truth, it’s not my favorite cookbook. I find the recipes to be too monotonous and uninteresting. Still, many people swear by this cookbook – I certainly did as a young’un. Other than the Little House Cookbook, this book was my go-to while growing up. 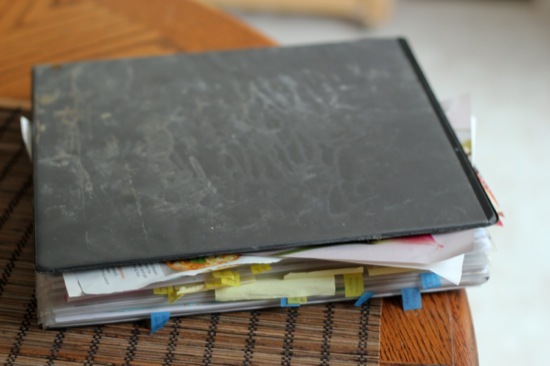 I remember choosing the tabs for different ingredients, like chicken, and making the first recipe on the page. I haven’t looked inside the newest version of this cookbook. For those who have it, what do you think of it? 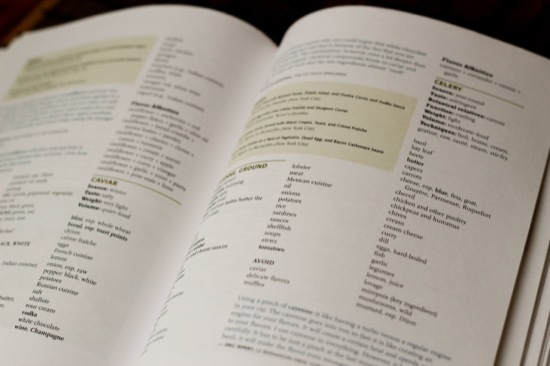 The Flavor Bible is a dictionary of ingredients and pairings. You look up your chosen ingredient (say, Meyer lemons) and see what the best flavor pairings are for that ingredient. I’ve used this book for previous Ingredient Week Challenges and it’s never steered me wrong. Sometimes, I just like to read through and check out some of the more unusual pairings (flounder and yuzu, anyone?). This book has certainly opened my eyes to adventurous cooking and the intricacies of flavor. (I swear, I didn’t open the book to Celery on purpose). I have a weird confession: I don’t really like cake. At least, I USED to not like cake. Give me creamy pudding or fruity pies or just plain chocolate. But cake? To me, it was often dry and flavorless. Particularly if it wasn’t chocolate. That all changed with this book. 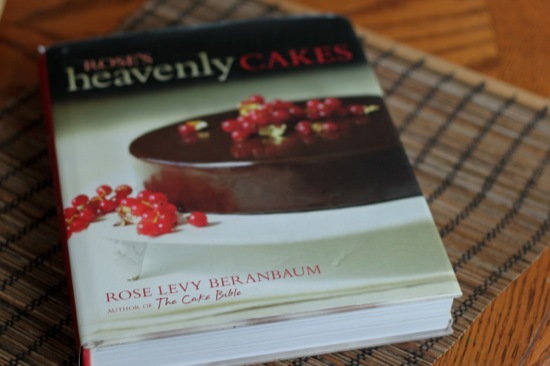 Rose Levy Beranbaum is a legend in cakes, and she has perfected the art of the fluffy, moist cake exploding with flavor. One bite of her spice cake with peanut butter frosting was enough to convert me into a lover of cake. (5) My homemade recipe book. Okay, I admit it: this is totally cheating. Still, I DID say I would present my most influential “cookbooks”, and this conglomeration of torn-out recipes and nutrition articles in plastic sleeves counts. Back in 2007, I started putting together this three-ring binder of recipes torn from magazines and printed from webpages. 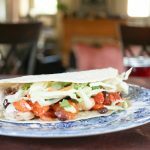 Having all my favorite recipes in one place reignited my interest in cooking and recipe development. 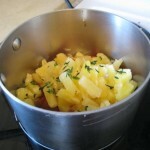 Since then, I’ve come up with tons of recipes, some of which I have yet to share with you. Here’s to many more years of culinary adventures! Q: What’s your favorite/most influential cookbook? P.S. I wanted to include Peter’s five most influential cookbooks as well, but as this post is already pretty long, I decided to feature them in a future post. Besides, Peter’s having trouble narrowing them down to just five (of course). Great list! I love that you included cookbooks from when you were younger! I had a kid’s cookbook when I was little, and I still have it. It had really simple “recipes,” and I loved making them. I don’t use a lot of cookbooks (as I can’t really follow a recipe…). But I do have a few Korean cookbooks I use for inspiration for my Korean meals (but I don’t think I have ever exactly followed a single recipe). The Flavor Bible sounds really cool! Mine is probably Bread Baker’s Apprentice by Peter Reinhart. I also love Molto Italiano by Mario Batali. I’m with you on the BH&G cookbook. I’m also really liking ‘Keys to the Kitchen’ and ‘Super Natural Every Day’ right now but I wouldn’t say they were super influential in my cooking. Bread Baker’s Apprentice is also a favorite with us! 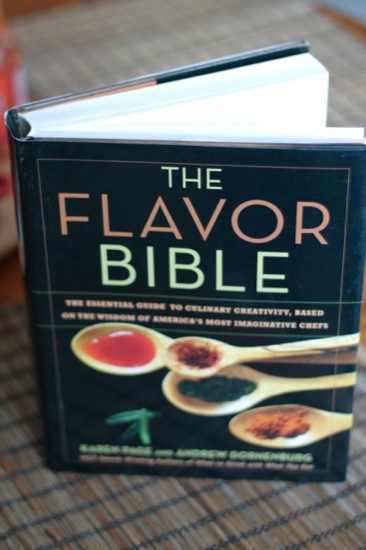 Ooh, The Flavor Bible sounds like a handy resource. I’ll add it to my list of cookbooks to eventually get. Well, can I say my Pinterest board?! I actually joined pinterest so I could get rid of some of my junk in my drawers and cabinets (overflowing with recipes and cookbooks). So…yes, my pinterest board is my favorite and most influential cookbook. AND I love The Art of Simple Food, by Alice Waters. 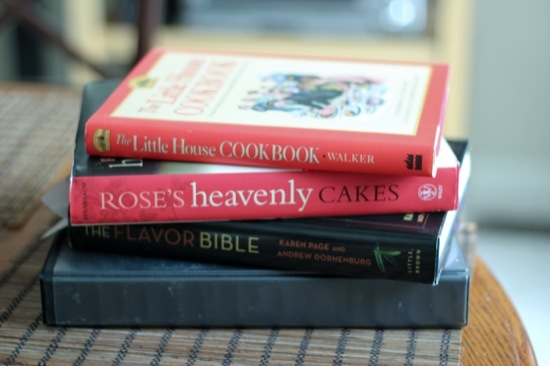 It’s interesting how different these books are…and wow, the Little House Cookbook?? That’s pretty neat. The ones I tend to use over and over again are Jamie Oliver’s easy to follow recipes, a vegetarian cookbook (can’t remember the exact name), and Once Upon a Tart for baking. Oh, how interesting it would be to take a long look at your recipe book Jessie. I’m sure, many stories can be shared from that one. As for myself…it’s a little difficult to pick from so many books that have crossed my table. If I’d really have to pick just one…I’d carry Anne Willan’s book: La Varenne Pratique. A real culinary treasure. I 100% percent recommend it! Let me know what you think.